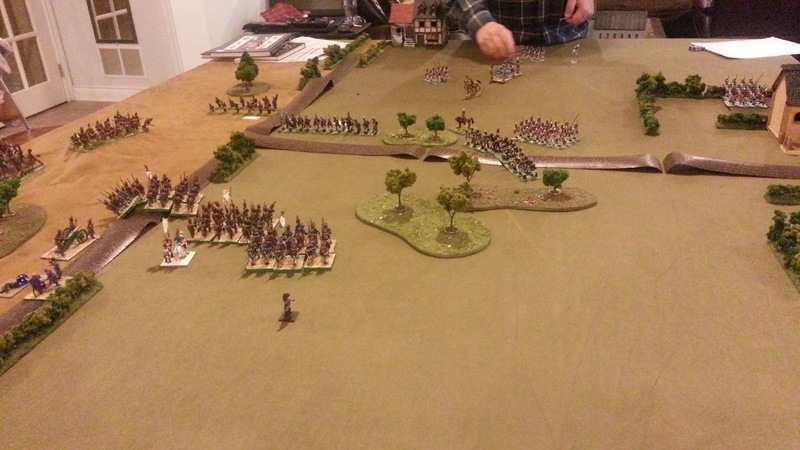 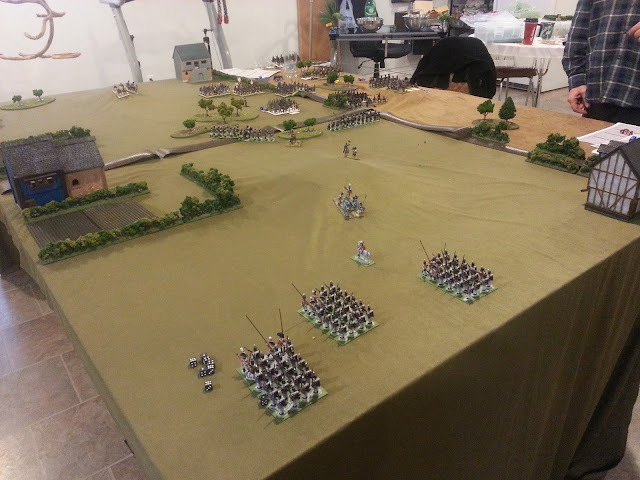 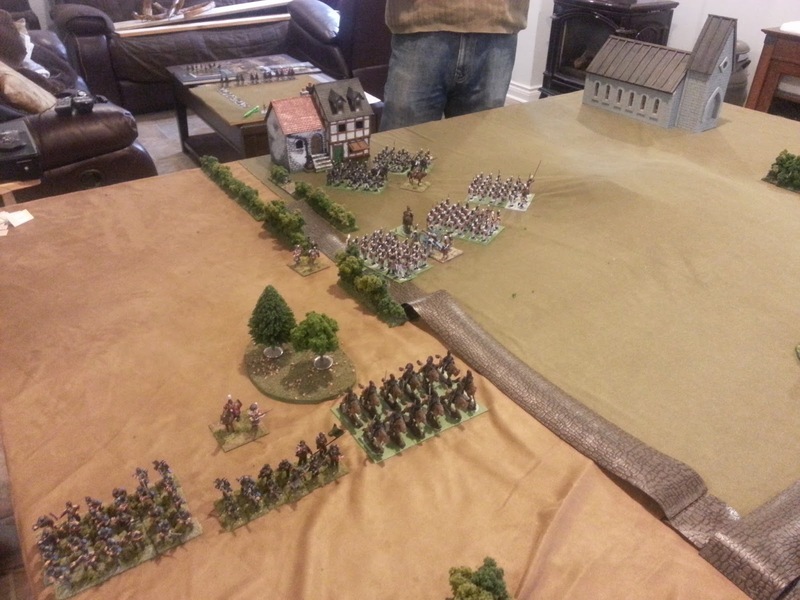 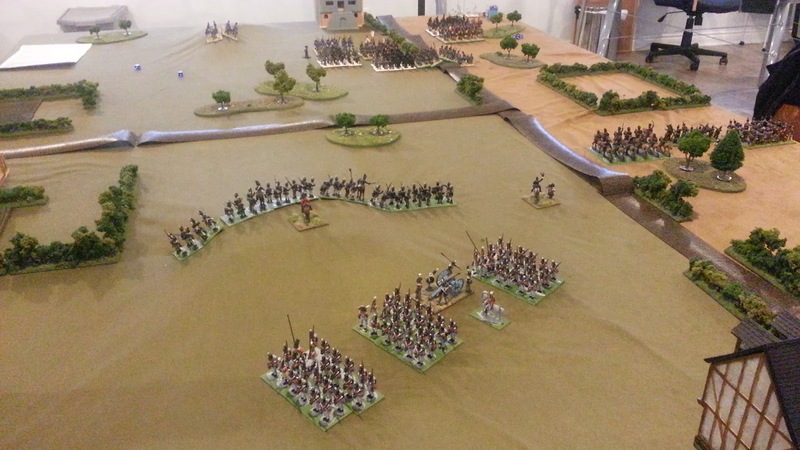 Dice Devils GC: "French Suffer Humiliating Defeat" in a Black Powder game..
Close-up of the British columns.. 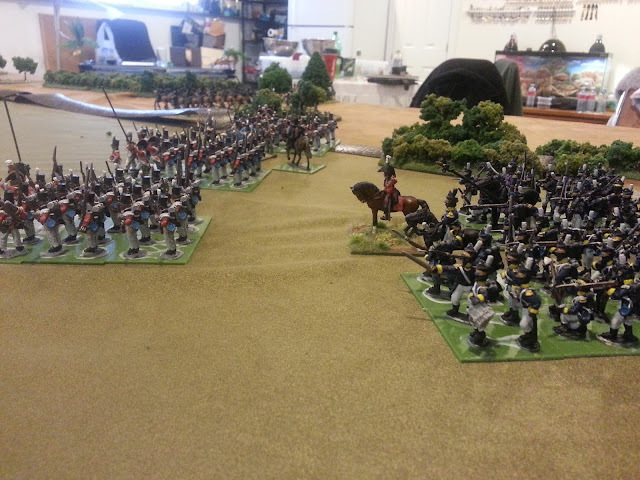 Both these units can Skirmish. 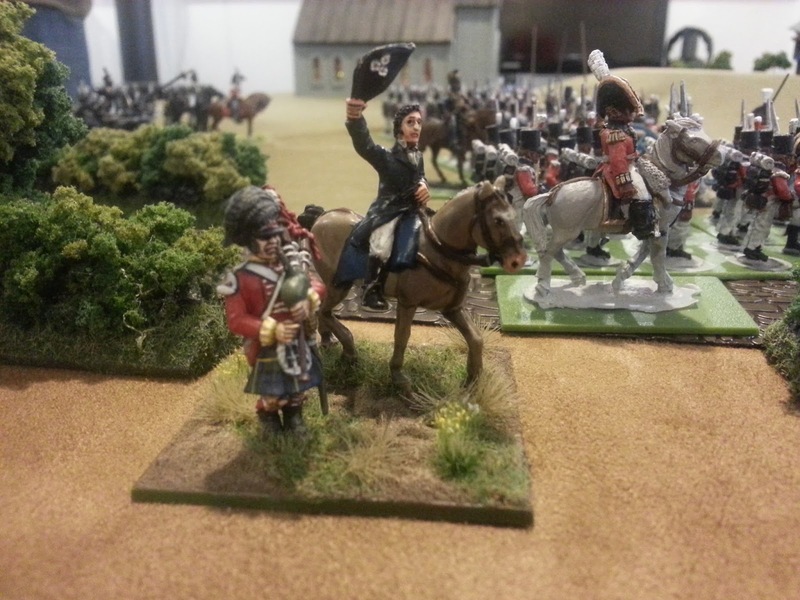 Cavalry are Hussars. Turn one, Brigade makes it to the ridgeline, with 3 supporting columns behind..
Close up of Brit infantry going the wrong way (left board edge) after a command 'Blunder' roll of double-six. 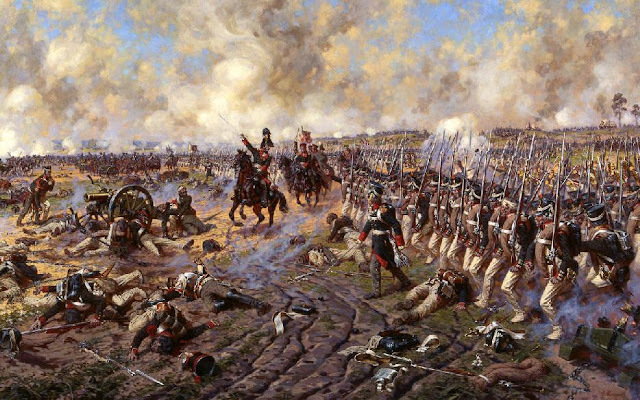 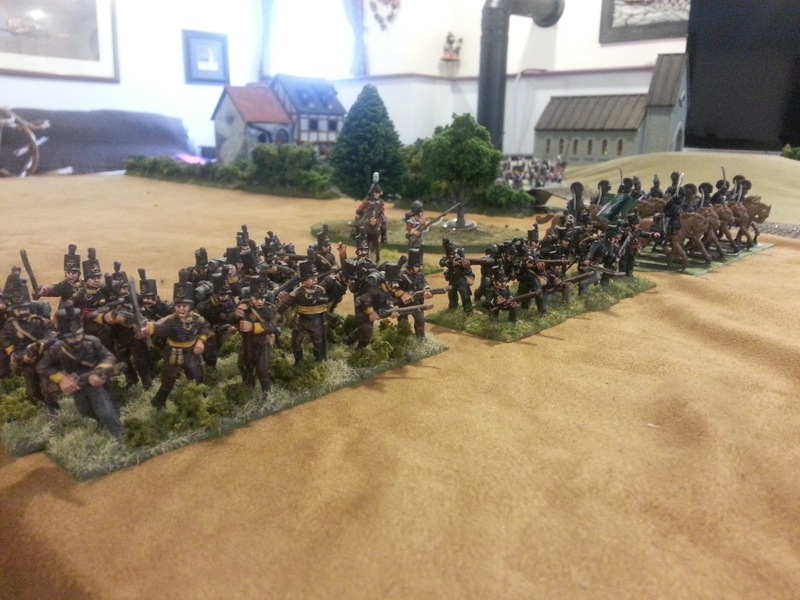 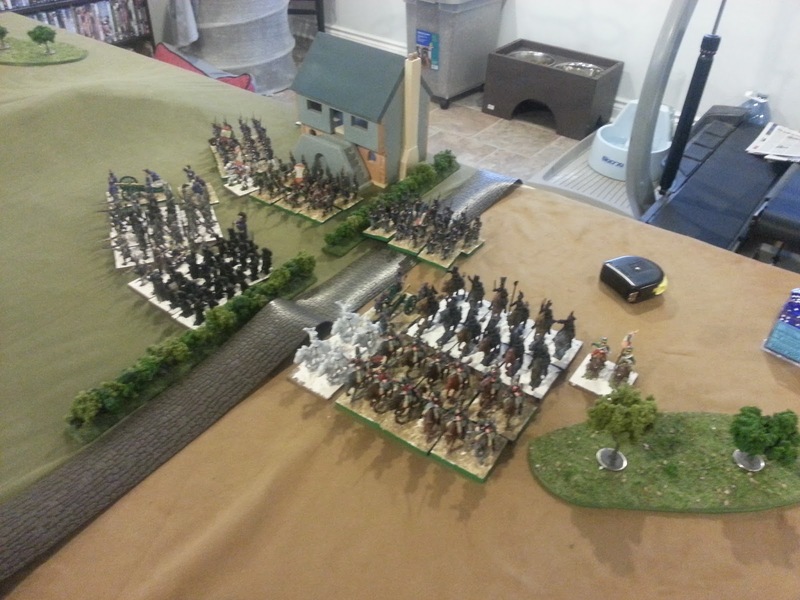 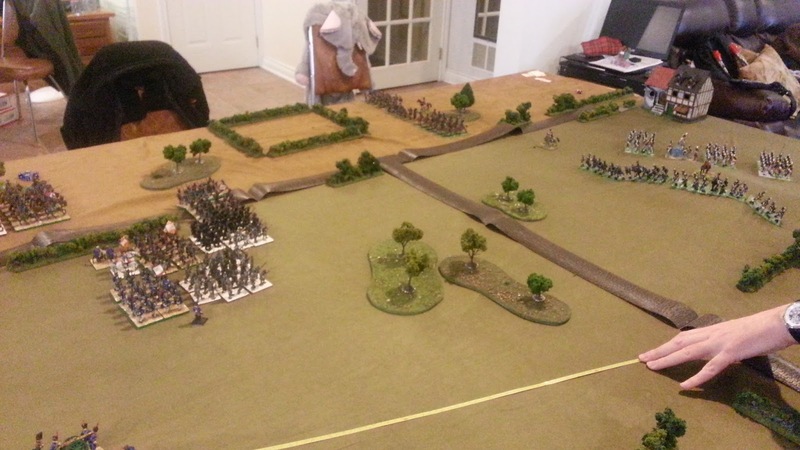 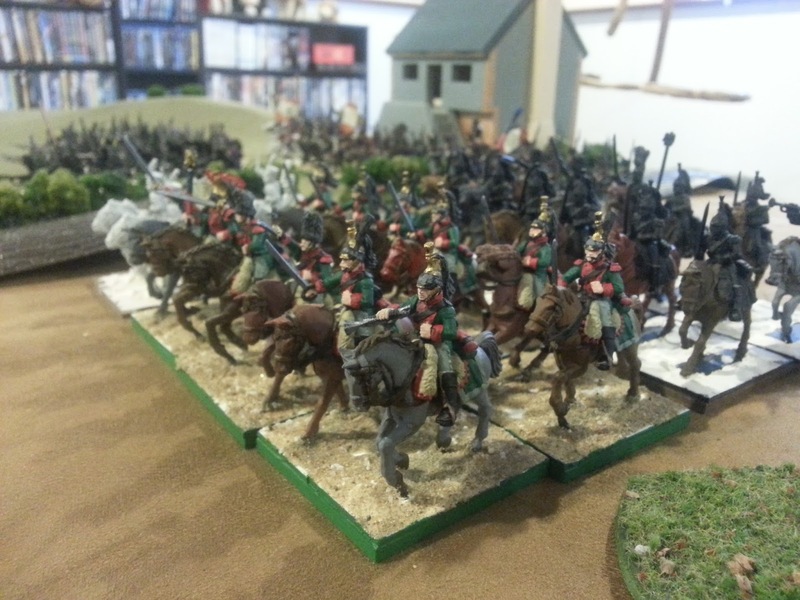 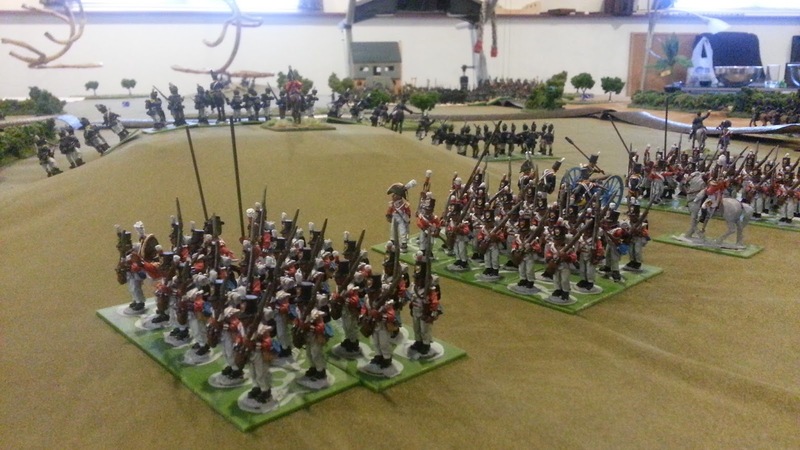 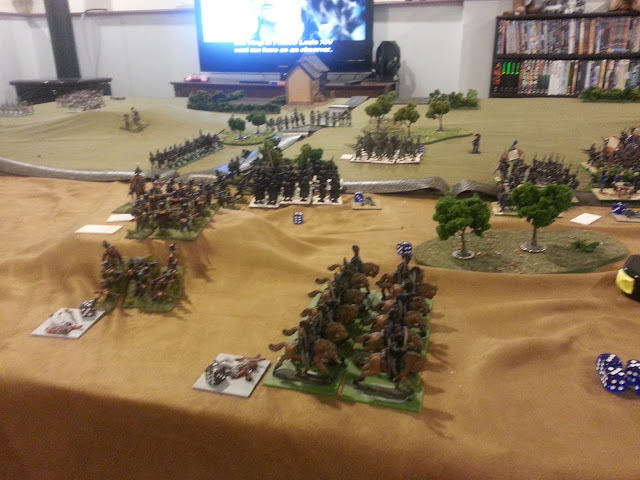 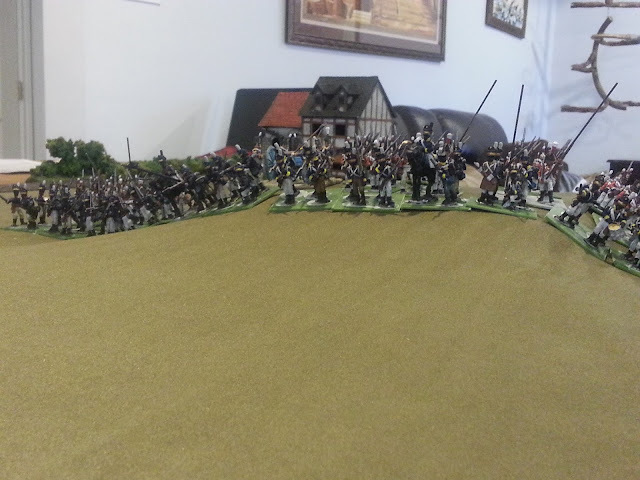 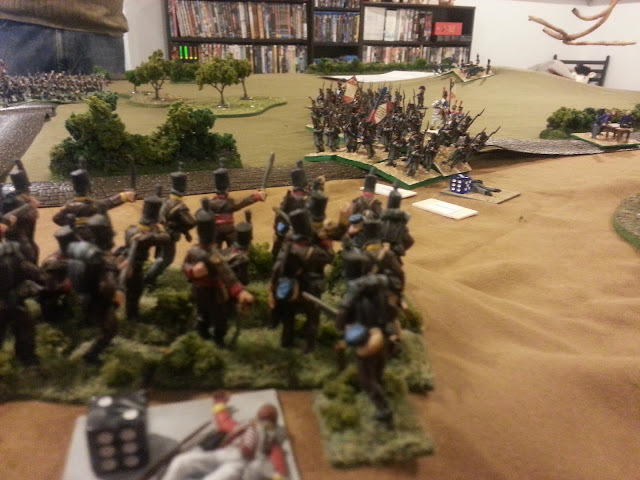 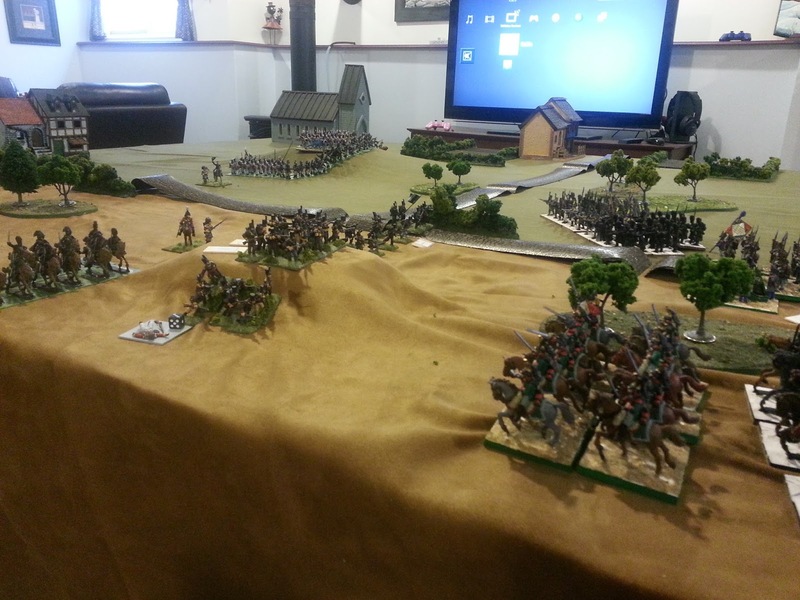 Meanwhile my French move en-masse, except my Cavalry who fail their command roll.. 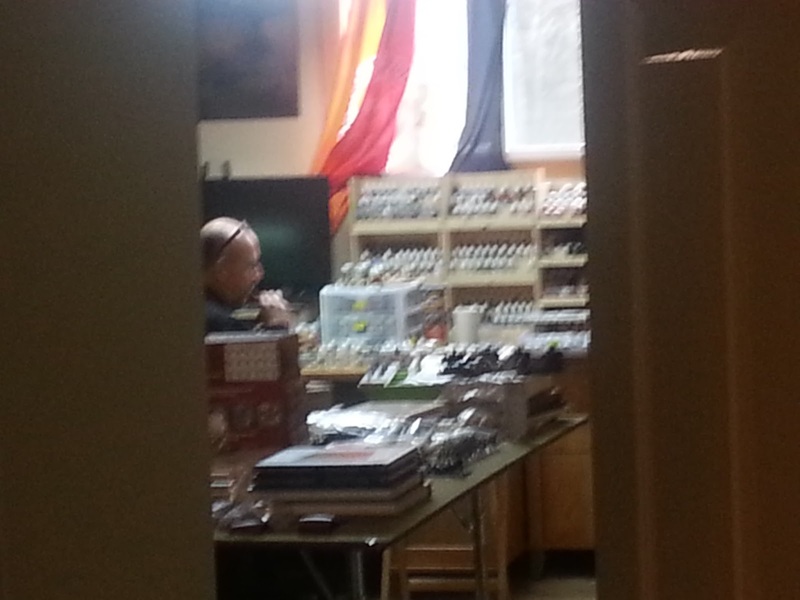 Rob came by, and was spied painting KGL (King's German Legion were British allies) with my cellphone zoom feature! 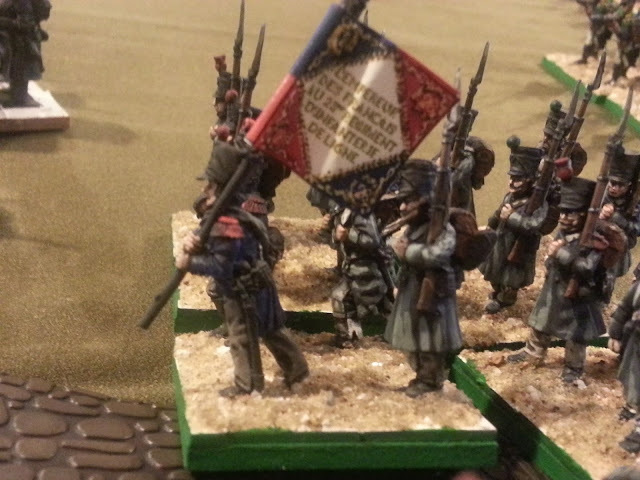 A promising start: Unit on the hill is Shaken and Disordered..
British firing line on the high ground..
Before getting routed, here is a close-up of the printed flag on my Line Infantry Battalion. Not bad for a download! Meanwhile the British support columns "Blunder" once again!!! At this point the British have their horseshoe shaped firing line set up, and with no Cav, the French are on the ropes..
Cannons are the only unit that can fire over friendly units when on hills.. These guys fired on my French every turn.. how do they have any ammunition left?? 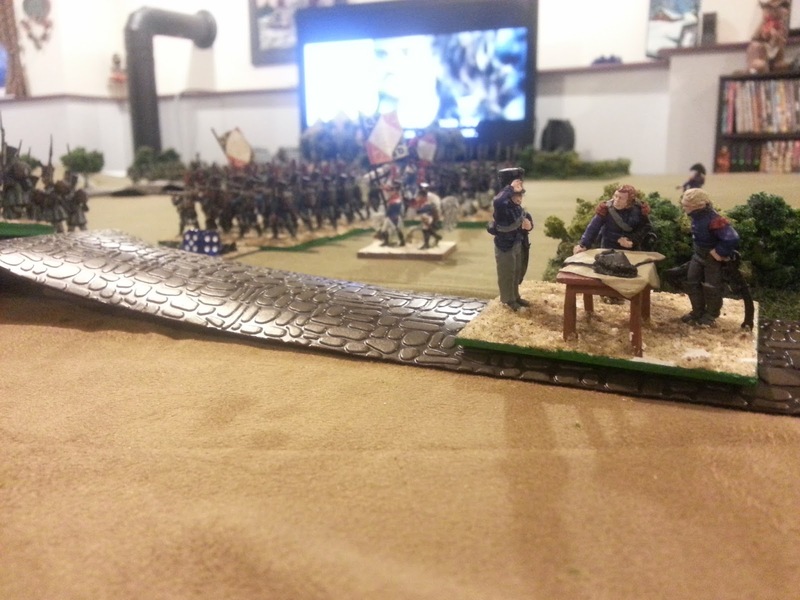 "Sir, I must report that our army has been decimated!" "Merci, Capitaine Obviousse"
And that is that. 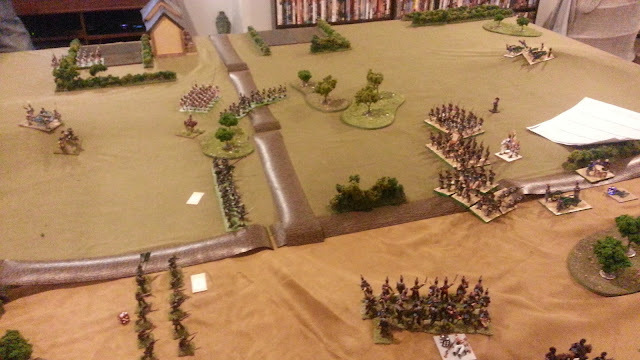 What a disaster.. once I lost my Cavalry, then the Brigade, then losing the second Brigade to the Firing Line.. it was all over but the crying. Hope you guys enjoyed it, because we certainly did.. even on the massive table, and with Scott's Infantry Brigade mucking about the rear for 5 turns, the game is fluid enough that they were able to come back into the battle by turn 8. 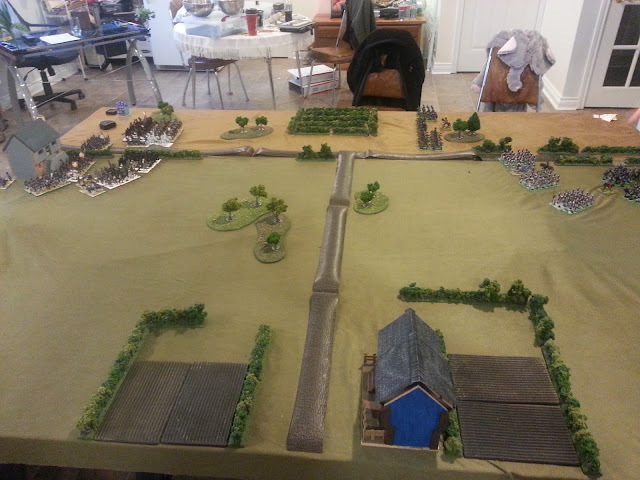 Great ruleset.